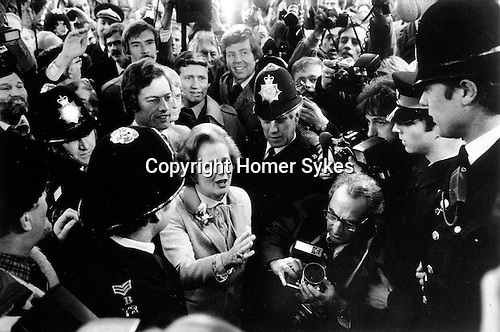 The 3rd of May, Mrs Margaret Thatcher followed by her son Mark meets the press as she goes to cast her vote in in the General Election at Chelsea Town Hall. The next day the Conservative Party victory was announced making the Iron Lady, Britain’s first female Prime Minister. Her body guard Duncan Campbell behind her in mackintosh and next to Michael Cole.